The Loudoun Bar Association awarded four high school seniors with scholarships at its annual Beat the Odds ceremony. The four students—all nominated by teachers and school counselors—were selected for their resilience in overcoming hardships. “I’m grateful for all of you. I’m grateful for your stories, I’m grateful for your life,” said keynote speaker Yasmine Arrington. Arrington, who established a scholarship fund for students with incarcerated parents while she was applying to college, spoke about keeping the faith—the theme of this year’s event. Park View High School graduating senior Anthony Portillo-Guevara was awarded a $2,500 scholarship and a computer. His physics teacher nominated Anthony after tore his ACL in December. A planned weeklong absence turned into a month as he recovered from his injury. His physics teacher and principal commended him for asking for help to maintain his A /B average while missing so much class. John Champe High School graduating senior Janay Jackson was awarded a $4,000 scholarship. Briar Woods graduating senior Favour MacJones was awarded a $6,000 scholarship. 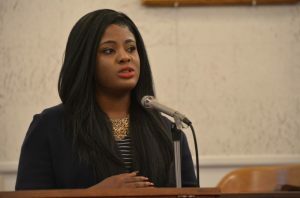 In her acceptance speech, Favour said she chose to move out of her home, for personal reasons. On finding herself homeless, she found a support in an “army of moms” in the Briar Woods community. 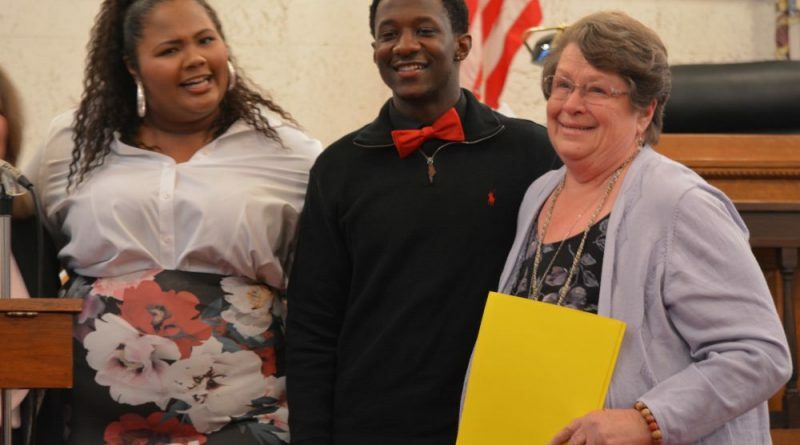 The Beat the Odds award—which comes with a $13,000 scholarship—was awarded to Rasheem Thornton, a senior at Loudoun Valley High School. At the end of his acceptance speech, a representative from Shenandoah University, where Rasheem will play football this fall, presented him with an additional $10,000 scholarship. After his father was arrested for dealing drugs and, years later, his mother became ill and couldn’t afford to care for Rasheem, he was taken in by a Purcellville family. At the close of the ceremony, Judge Pamela Brooks spoke about where some of the Beat the Odds recipients are now: they’re in law school, pursuing graduate degrees, working as engineers and teachers. The Loudoun County Chapter of Beat the Odds was founded by the Loudoun County Bar Association and the Sheriff’s Office. Since 2005, Beat the Odds has given out 55 scholarships, totaling over $151,000 in scholarships. Caroline Boras is an intern for Loudoun Now. She’s studying journalism and Russian studies at Washington & Lee University.